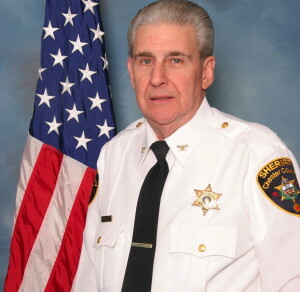 Sheriff’s Chief Deputy James Moyer, who died Friday, had 31years of service with the office. The Chester County Sheriff’s Office is mourning the loss of its chief deputy, Sheriff Carolyn “Bunny” Welsh said Monday. She said Chief Deputy James Moyer died peacefully in his sleep Friday morning, 31 years to the day that he was hired by the sheriff’s office, she said. Born and raised in Parkesburg, Moyer was 67, Welsh said. A memorial service has been scheduled for Jan. 26 to honor the chief deputy’s long law-enforcement career, which included serving as police chief in Parkesburg, Welsh said. The service will be held at 2 p.m. at the Hephzibah Baptist Church located at 2237 Strasburg Road in Coatesville, following visitation from 11 a.m. to 2 p.m.
Welsh said her office is working with the family to plan the service and is inviting all law-enforcement agencies to participate with both personnel and vehicles at the church. She asked that agencies who want to be included should contact Sgt. Jason Suydam at jsuydam@chesco.org or Cpl. William Czaplicki atwczaplicki@chesco.org. “Please continue to keep the Moyer family in your prayers,” Welsh said.